The majority of my customers come to me by recommendation from friends and family of other kitchens and bedrooms I have previously fitted. I don't have an actual showroom, this being the case I manage to keep prices lower than you might expect and all work is guaranteed. I will come out to measure up and discuss with you exactly what it is that you want. I have a wide range of door and worktop styles and colours with plenty of choices of appliances, sinks and taps too. Once you're happy with the plan and price I will build it in my workshop and then fit it, this way I can manage the whole project from start to finish. If you prefer to give your kitchen a make over with new doors, handles, worktops, sink or appliances then please give me a call. 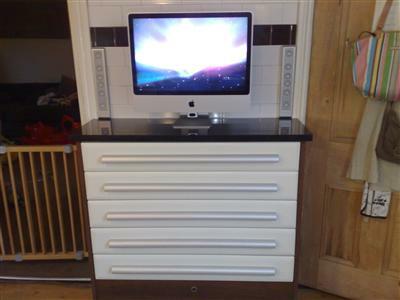 A wide range of bespoke home offices is available too.